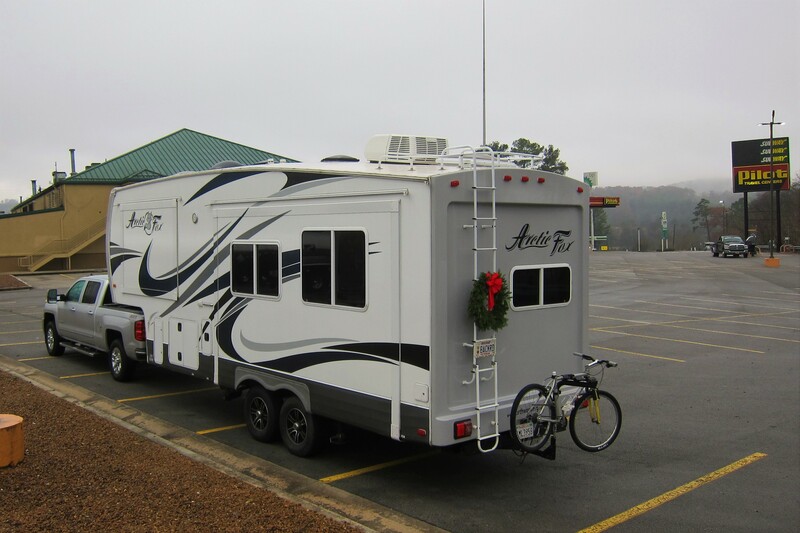 Thursday, December 1, 2016: It’s 0415 hours and we are underway for our ninth consecutive winter RV trip for parts of America yet to be decided. The temperature on this late fall morning is in the mid 40-degree range and the skies are gloomy with a steady rain. The only plan we have until Christmas is to head south and at some point, hopefully when the weather or our mood allows, make an abrupt right turn. Leaving on these trips in early December has become the new normal for Kit and me. A few years ago the family decided to merge Thanksgiving and Christmas into a unique Festivus style celebration we call Thanksmas. 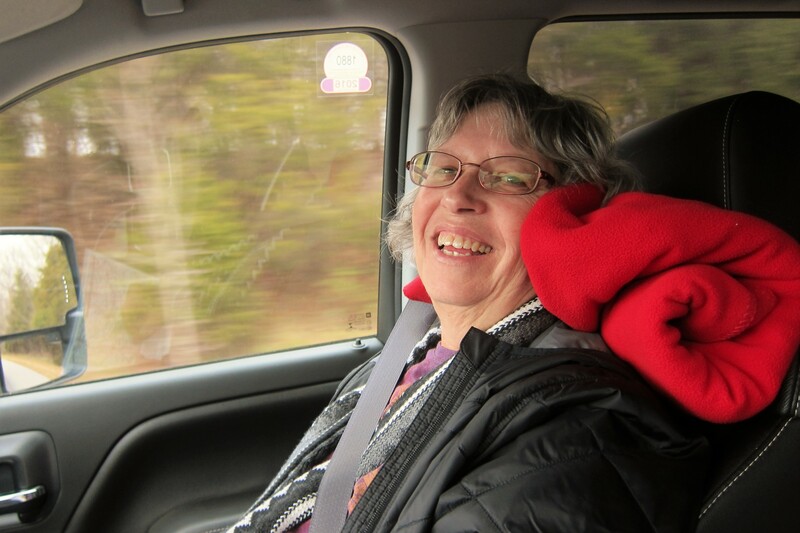 We had a great time last week celebrating Thanksmas with our resident Maine family. Oldest daughter Kim, oldest grandson Joe, and granddaughter-in-law-in waiting Abby, brought joy and food to the celebration. 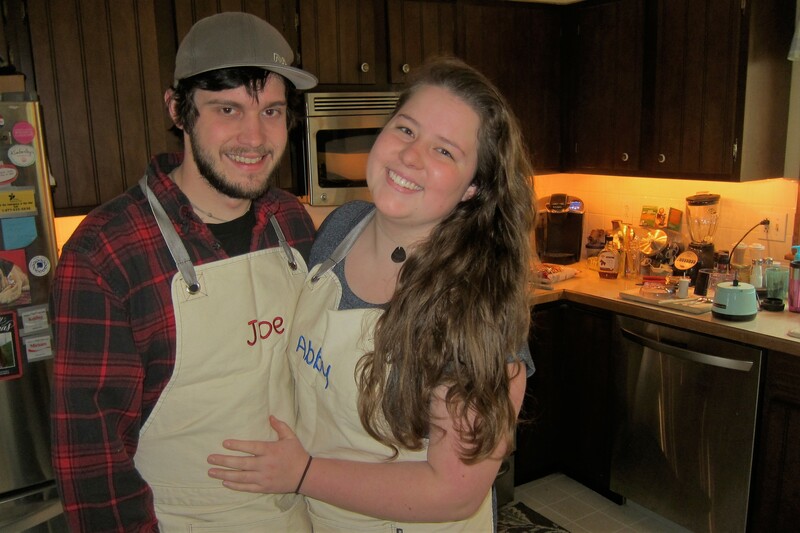 In fact, Joe and Abby planned and prepared the Thanksmas meal! And an incredible feast it was! 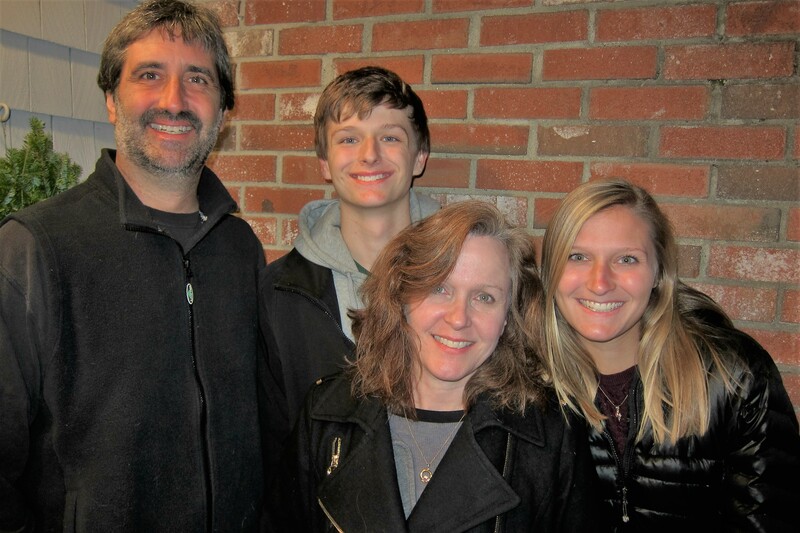 Also in attendance were our son and his family, Joe, Chris, Ann and Katie. Who provided some delicious items to add to the Thanksmas groaning board as well. 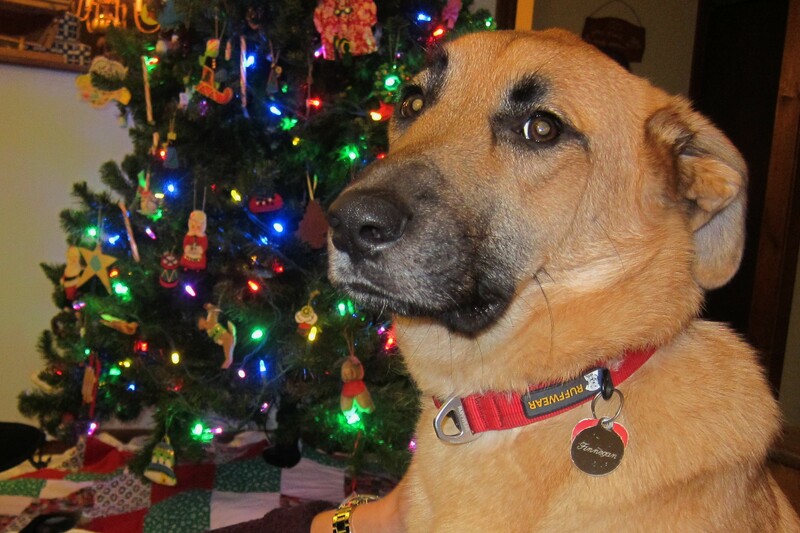 …and Finny wondering what all the fuss was about. 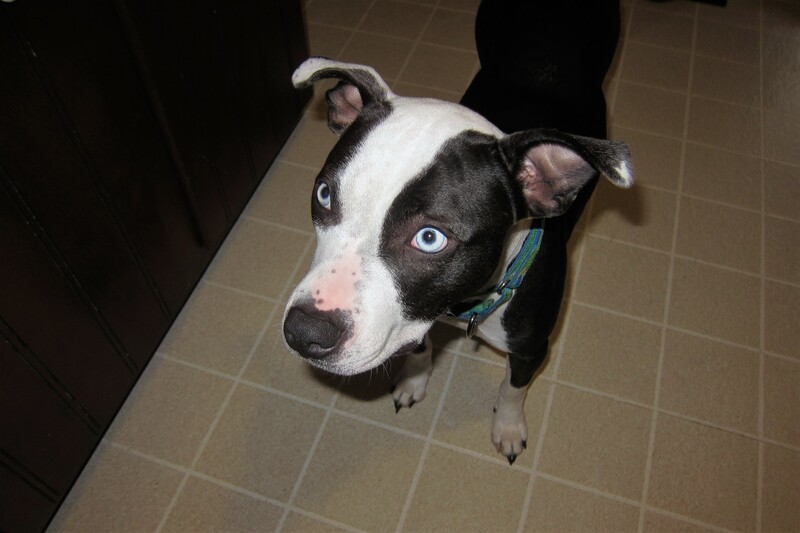 And a special guest from the Coastal Humane Society shelter was cute little Lola. 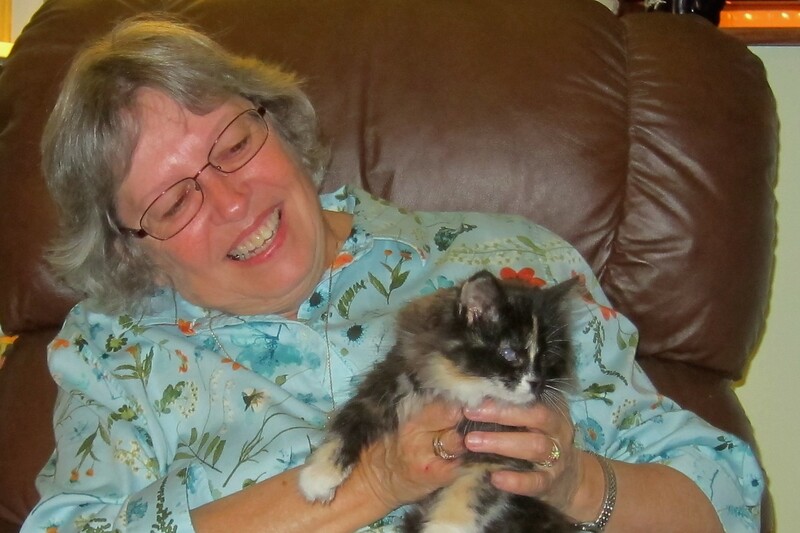 A foster kitten being cared for by Abby who works as a Vet Tech at the shelter. It was great having most of our family around the Thanksmas table. We look forward to sharing the formal Christmas holiday with the remainder of the family, including our two youngest grandsons, when we make it out west. I love the beginning of these trips and looking forward to the surprises and unexpected adventures that lie ahead. And on this morning, I was feeling smug in the way this year’s trip came together. Using a check sheet for preparation gleaned from past Excellent Adventure trips made the process easier. However, I had this nagging feeling that I had forgotten something. Looking to my right, I noticed, much to my relief, that Kit was riding along….so what could it have been? Oh nooooo…this is embarrassing! The following is an excerpt from the handwritten journal that Kit keeps as we roll along…it painfully describes the FUBAR. There are many excuses that I could provide for this slipup but really no plausible reason. With all the preparation, and checking, and rechecking, how could I forget something so large, so important, and so obvious!?!? So, a quick exit and return to the point of departure was necessary…yes, necessary! I don’t travel without the essentials, and in my world, a bike is essential! Had it been a few hundred miles further south before I discovered the forgotten bike, it would have been an opportunity to go shopping for a new one! I found my forlorn two-wheeler propped up along the garage wall where I had left it yesterday after airing up the tires, and lubricating all the moving parts in preparation for hanging it on the camper’s bike rack. Fortunately, none of the neighbors were awake at this hour so my dignity remains intact….at least for a little while. Underway once again at 0501…the detour added an additional 45 minutes to what has historically proven to be a long first day on the road…oh well. The above photo is also an excellent example of the teamwork in putting these travel journals out every 10 days or so. 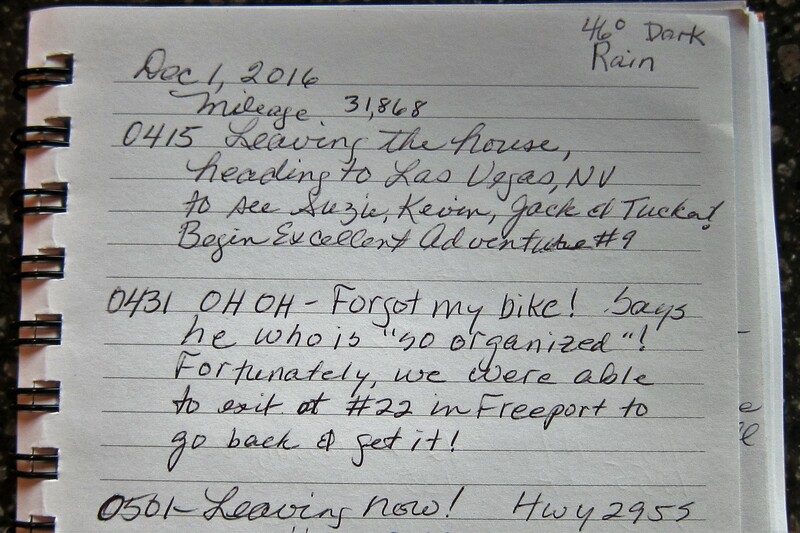 Kit does an excellent job in documenting our doings as we meander about, then I use her logbook as a reference for composing the journal and adding photos. And before posting the journal to the website, Kit proof reads and edits the final product. After which it is uploaded to our website for all the world to see what a numbskull I can be. 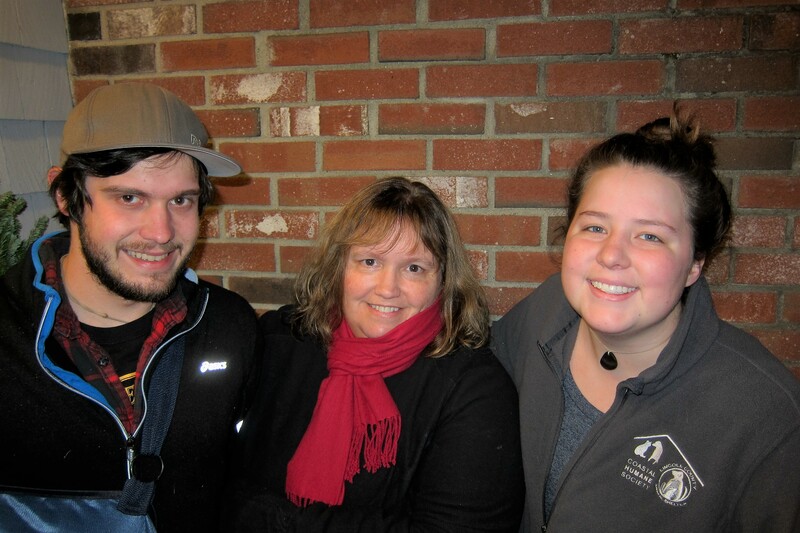 At 0600, Kit and I pulled into the Kennebunk rest stop as is customary practice. I like to check the temperatures of all eight tires and do a visual check of how things looked on the rig. Plus with the camper winterized, it’s a good place for a pit stop. As you can see, it is still raining which stayed with us until reaching the town of Ogunquit. Trundling along I-95 heading south we crossed the border into New Hampshire at 0640 and into the State of Massachusetts some 15 minutes later. At 0730, as Kit and I were nearing the city of Andover the skies began to clear and the sun peeked out. 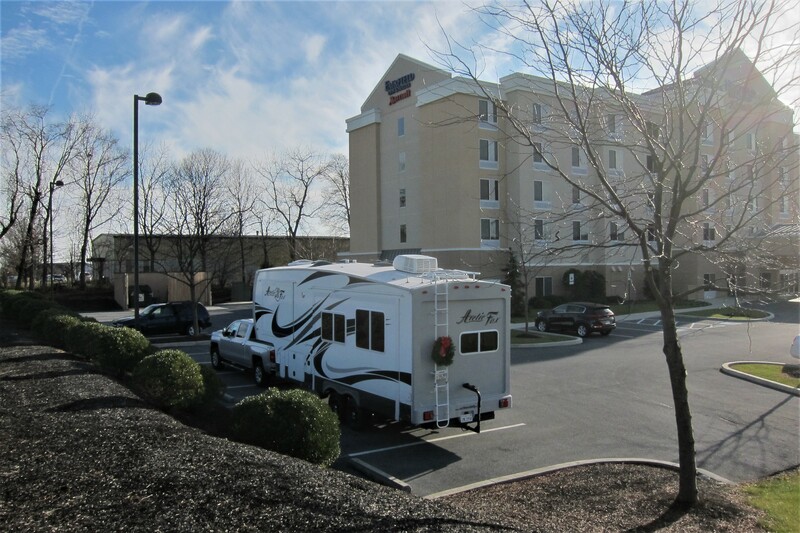 Day one of our annual winter RV adventures is always a long, tedious, drive through five states…there is no other route to efficiently depart New England, at least this time of the year. On a normal Excellent Adventure travel day, we average about 250 miles…but on the this first day we endure a 550 plus mile day. Now, don’t get me wrong, there are many interesting things to see and do in New England, many of which we have enjoyed over the 35 years we have lived in this area of the country. However, it is far more pleasant to explore the northeast in summer than winter and factor that with the unpredictable weather added to the desire to get in warmer climes, we have only one mission…head south rapidly! 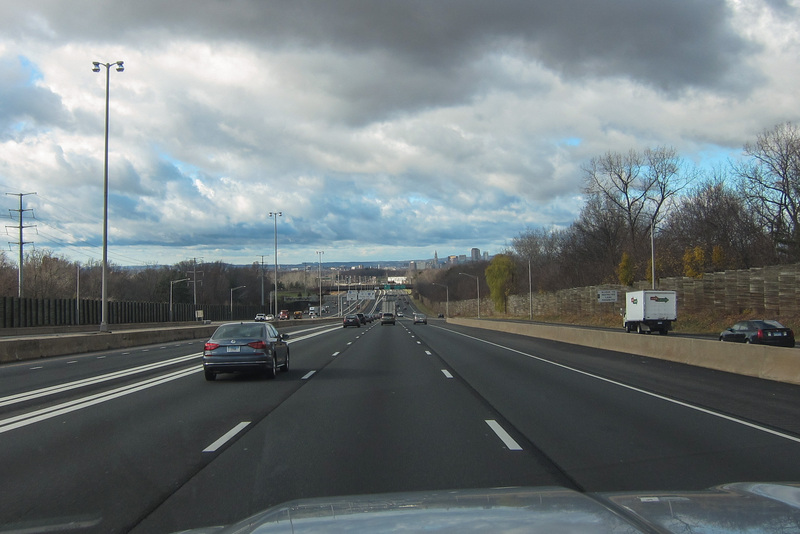 Merging onto the Massachusetts Turnpike we encounter an interesting change to the method of collecting tolls…the toll booths are gone! Payment for passage is now facilitated by electronic monitoring with bills being mailed to the traveler…good luck finding us in the Desert Southwest! I’m guessing, the toll takers jobs were moved to Mexico where confused locals are unable to understand Mass Speak or why they’re suddenly paying for travel in a country they don’t even live in! Can’t some politician do something about this?!?! Rolling across the Connecticut border at 1100 the weather had turned perfect for travelling! Sunny with a few clouds, light winds, little traffic and the sun over our shoulder. At 1130 Kit and I piloted the rig into New York and 45 minutes later were transiting the Hudson River near the town of Newburgh, NY. 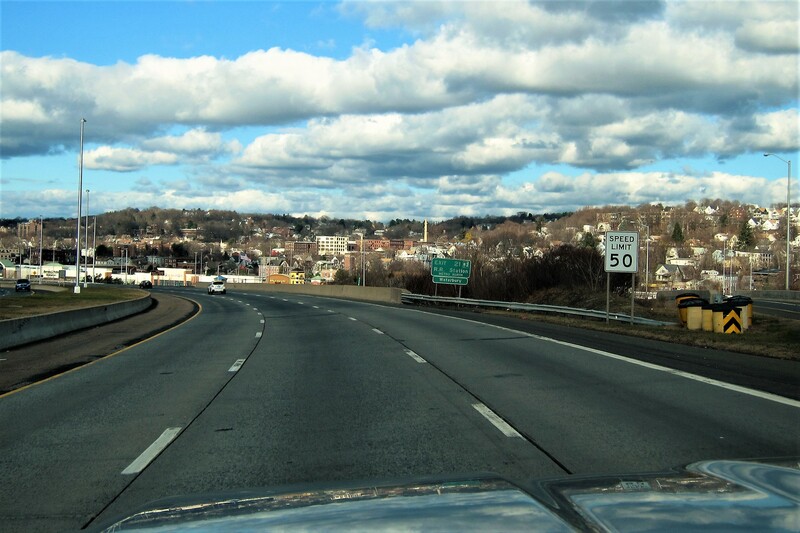 At 1350 hours, the State of Pennsylvania came into view and an hour later found us on the main north-south US artery, Interstate 81…also known as the Truckers Route. Around 1730 hours, after a 13-hour travel day, we noticed a roadside billboard (remember those?) for a Cracker Barrel Restaurant and decided to treat ourselves. Yea, I agree, the food at Cracker Barrel is not high cuisine, however they are RV friendly, provide plenty of caloric intake for the money, allow Kit to engage in some retail therapy, and consistently OK.
Back in the truck for the short hop to our favorite first night stopover, The Fairfield Inn located in Carlisle, PA. These folks have consistently accepted us, and our rig, on their property and the convenient location makes for a great stop after a long day. In addition, they feature fresh baked cookies, fresh fruit, and drinks to the weary traveler. We are beat! Today’s statistics…14 hours since departure and 594.4 miles driven! Goodnight all! Friday, December 2, 2016: Up early, spent some time on our iPads, then enjoyed a rather nice continental breakfast before filling the travel mugs with fresh coffee and hitting the road. One unusual item I noticed in our motel room was the following lockset on the bathroom door. 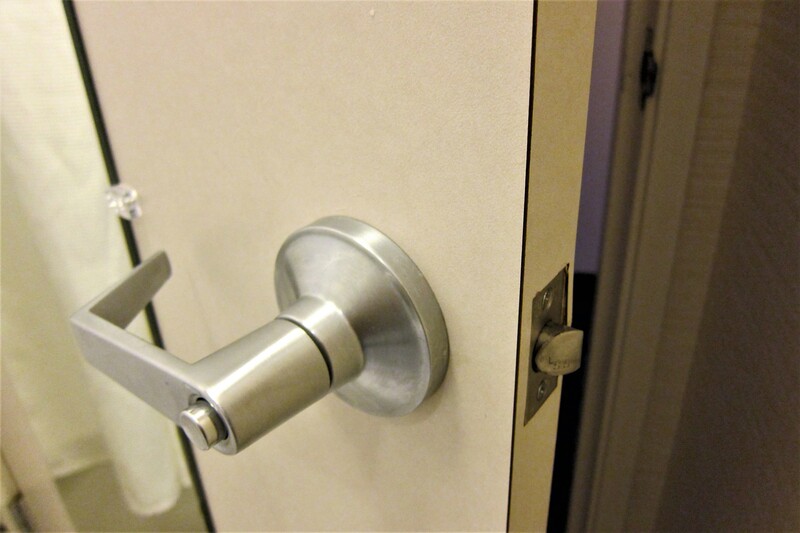 Yep, the latch-bolt appears to be installed backwards! Kit thought that maybe it was done intentionally so anyone locked in the bathroom could be rescued by simply pushing on the door, but I think not, someone messed up! Jumped back on I-81 South under sunny skies with temperatures in the mid 40-degree range. Since today is our grandson Jacks 12th birthday, we gave him a call on speakerphone and sang in the most off key way possible, in other words, normal. Jack thought it was funny, or maybe weird…. either way is OK with us. 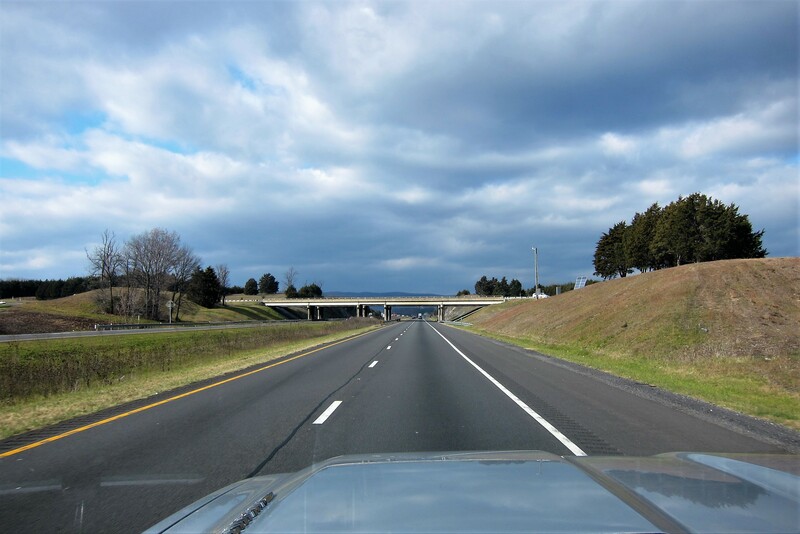 At 1105 hours Kit and I crossed into Maryland and twelve minutes later found us crossing the Potomac River and entering the State of West Virginia…the top portion of the Southern Bible Belt. 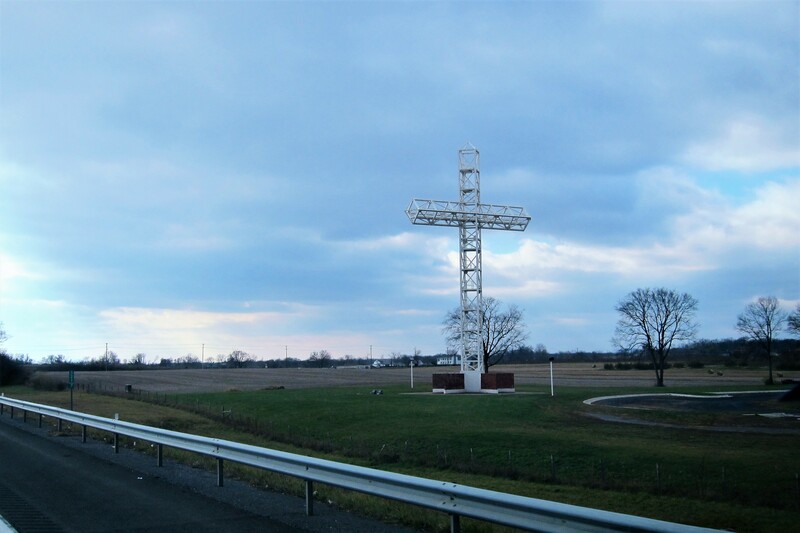 These “yuge” Christian crosses are interspersed along I-81 throughout the south…many are associated with a church, but others sprout out of a random farm field. It appears that a competition of piety is going on as each cross is “yuge’r” than the one before. Clouds start to gather to the south (hope this isn’t the result of my crack about the crosses!?!?) and we notice how green it is at this latitude at this time of the year. Nearing 1600 hours, Kit found a convenient campground in the town of Salem, Virginia and a Food Lion grocery store in route…. a win-win! 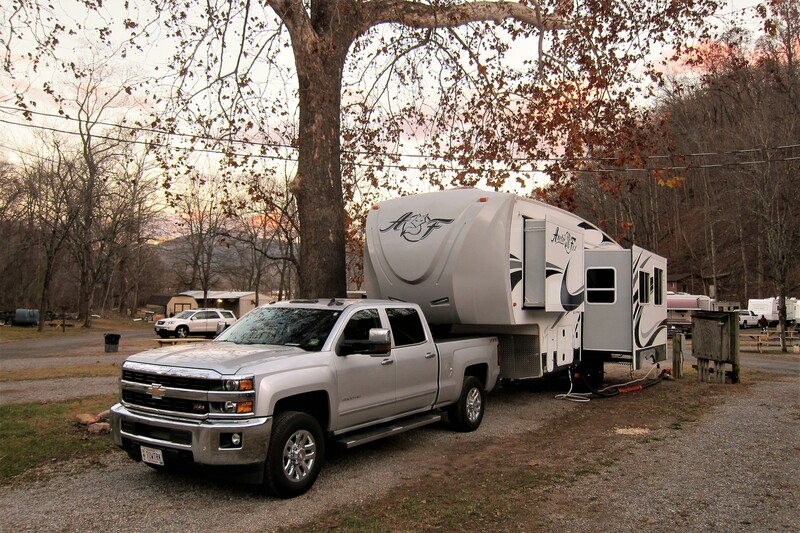 After filling the camper’s larder, we made our way to the Dixie Caverns RV Park and set up for the night. While visiting with the campground owner as I registered, he mentioned that there is a cavern on the premises that one can explore…hum, might be a late start tomorrow!? Saturday, December 3, 2016: Woke following a restful night, had a quick breakfast and met Matt at the cavern’s entrance for a guided tour of the cavern that honeycombs the adjacent hillside. The cavern was discovered in 1920 by two young boys and their dog. While messing about on the wooded mountain, the dog fell down a small hole and was unable to get out, so the boys climbed in to rescue the pup and noticed a series of interconnecting caves. 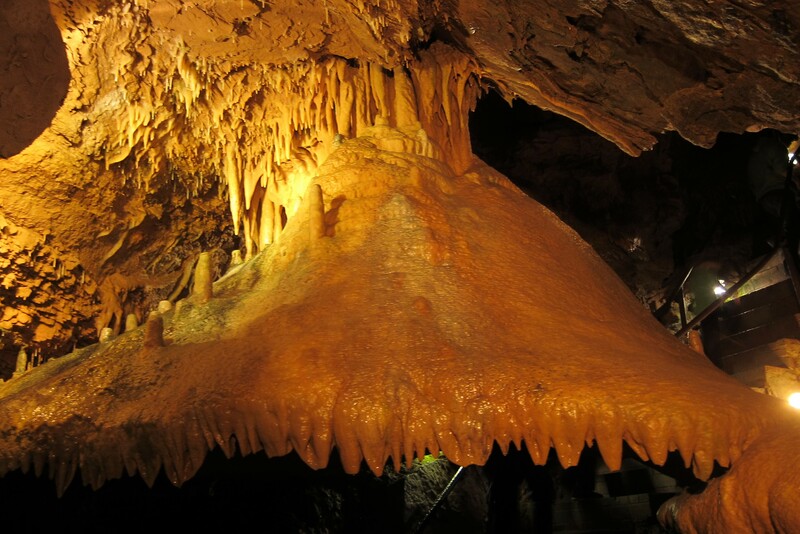 The cavern is primarily limestone and was carved by an underground spring that eroded the soft material. Today the cavern continues to evolve due to surface precipitation that seeps in forming various dripstone features such as “The Wedding Bell”. The large bell shaped feature with stalactite dripstone formations encircling its rim is a popular venue for weddings. As the bride and groom stand under the bell, drops of water, known as “Cave Kisses”, land on the couple promoting good luck…I guess a fitting occurrence if your marrying a drip! After notifying the farmer who owned the land, the boys were allowed to explore the cavern even more thoroughly. Permission that would never be allowed to happen in today’s world of liability and litigation. 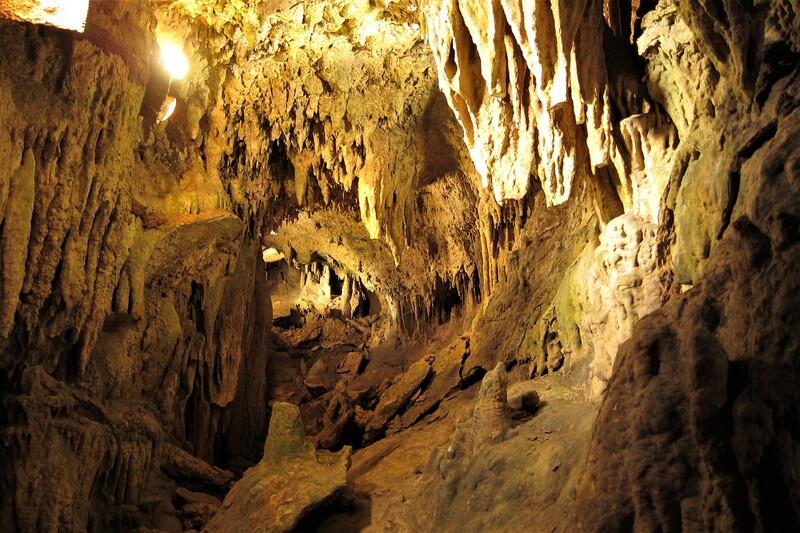 Eventually, the boys persuaded the owner to explore his cavern with them and he realized that folks would pay good money to see the formations within. The farmer, hired the boys to act as tour guides, and advertised the attraction. Needing a name, the young tour guides suggested Dixie. Not because it was in the south, but because it was discovered by Dixie, the dog! One of the more striking elements in Dixie Caverns is what became known as the “Bat Tubs”. These are hollow formations that collect water that has percolated down from the surface. These pools are a mere few inches deep but appear much deeper when viewed from an acute angle. So, why call them Bat Tub’s, well where else would the resident’s clean up? 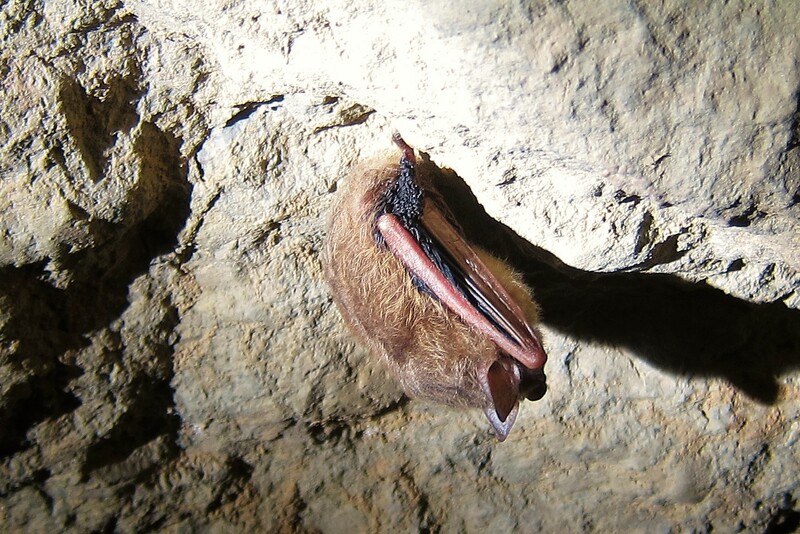 These cute little fellows are hanging by their heels throughout the cavern and give flight each night to exit the cavern and forage for food. I enjoy caves and caverns and have toured many them throughout the US, however this small cave system is one of the better privately owned caves I’ve explored. 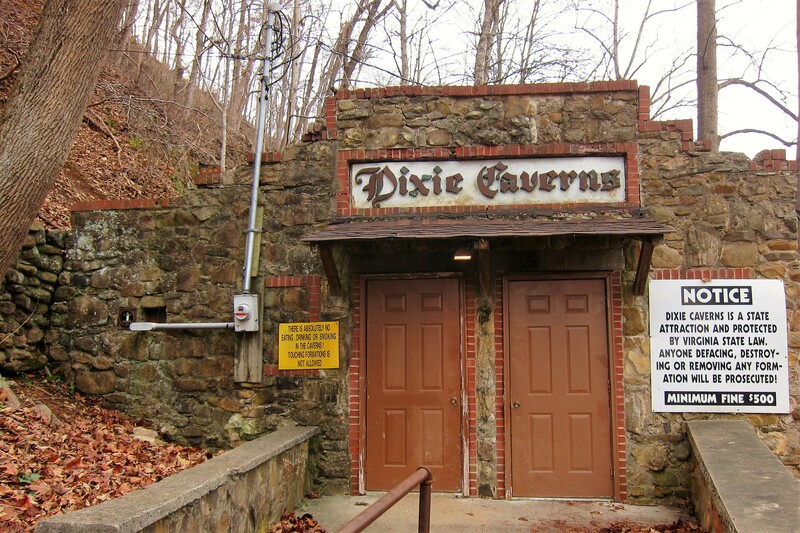 If you ever find yourself in Salem, Virginia, make time to see Dixie Caverns! Underway shortly before noon and headed south once again on I-81. Two and a half hours later we crossed into Tennessee and by 1540 hours few were on I-40 heading west. Readers of this journal will remember that I like to snap at least on photo of my traveling partner, with neck pillow in place, and cocooned in her bright red blankie, slumbering the miles away. Well as the camera sent out the focusing beam of light, the intended victim was alerted and caught me in the act! Oh well, there’s always another day and another opportunity to capture that embarrassing photo. It’s been a short travel day but Kit discovered an interesting place to stay using the app “All Stays”. 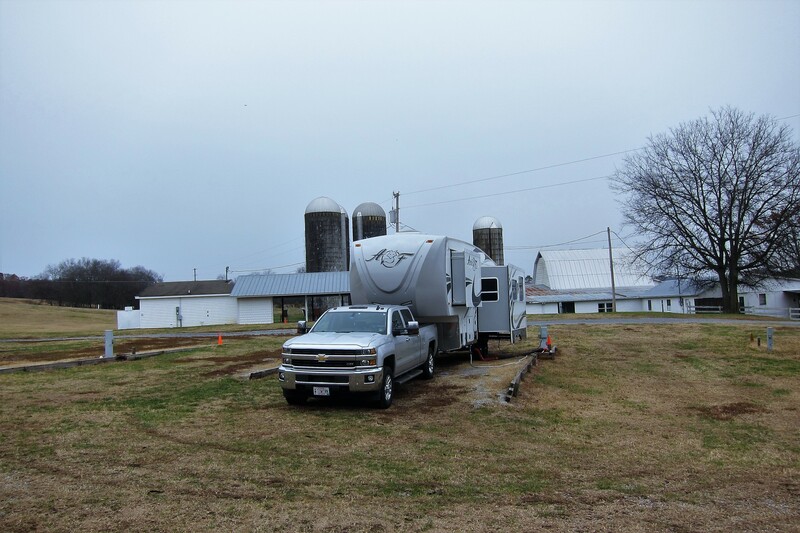 Yep, Dumplin Valley Campground is on a farm, and not just any farm, but the regional venue for the great southern fiddler’s convention held each fall. At other times of the year, Joe the Farmer, rents out the campsites to the traveling public for a small fee. After a nice meal, and some journal writing, it was off to bed…goodnight. Sunday, December 4, 2016: Experienced an overnight rain and woke to a soggy campground. While pulling out of our site the rear wheels began to spin, but a quick application of four-wheel drive solved the problem and we were on our way. For the second day in a row we found some interesting places to explore in the area before making progress toward the south. Kit has taken up cooking with cast iron (again) and the Lodge Factory Store is just down the road a piece. And since what Kit wants, Kit gets, especially considering her arsenal of cast iron frying pans and a pretty accurate throwing arm. So, we delayed our morning departure and headed to the store. Arriving, I noticed the Smoky Mountain Knife Store right across the way! So, I had my morning set! 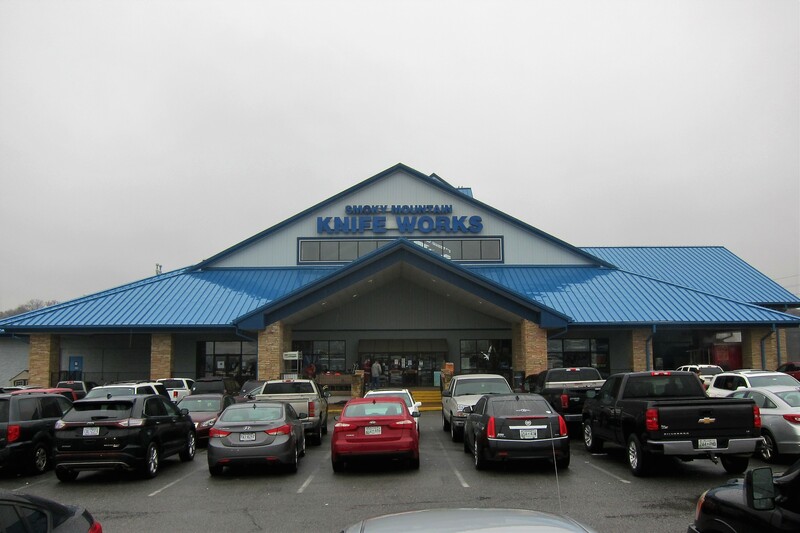 This place is huge…containing every knife manufacturer and every product they sell; even a variety of fully custom hand forged knives selling in the four-figure range! 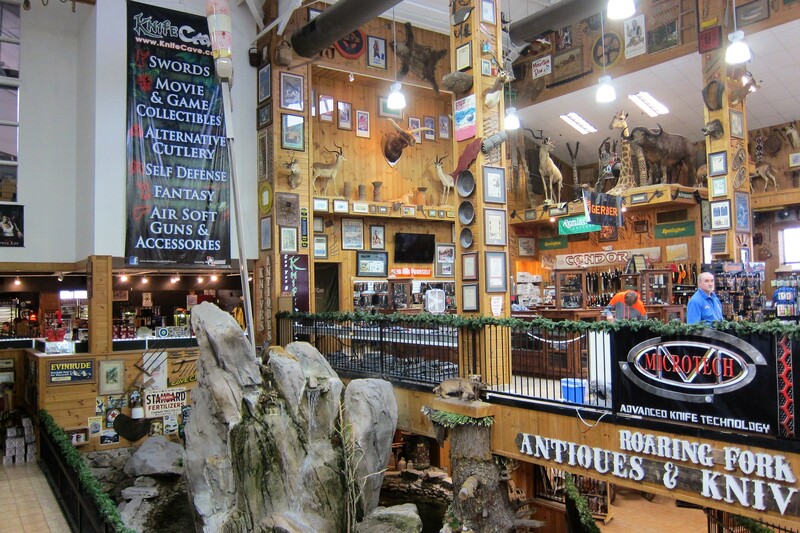 It was entertaining to look at all the merchandise and the customers that were drooling over said merchandise while extolling the virtues of the various brands. After an hour, Kit and I met back at the rig and shared our purchase choices…Kit’s was far more practical but I bet my selection will prove to be much more entertaining. Finally, back on the road shortly before noon we continued south on Interstate 40 until the outskirts of Knoxville and then merged onto I-75 headed south toward Chattanooga. Then I-59 took us further south into Georgia, where we crossed the border at 1500 hours. An hour later we stopped for fuel at a Pilot Truck Stop in Rising Fawn, GA and discovered an excellent overnighting opportunity. The store parking lot was large and away from the long-haul truckers that were filing in. So, we parked out of the way and enjoyed an ideal free camping opportunity for the evening! Monday, December 5, 2016: Up at 0700 and grabbed some trucker’s coffee from the store before hitting the road. 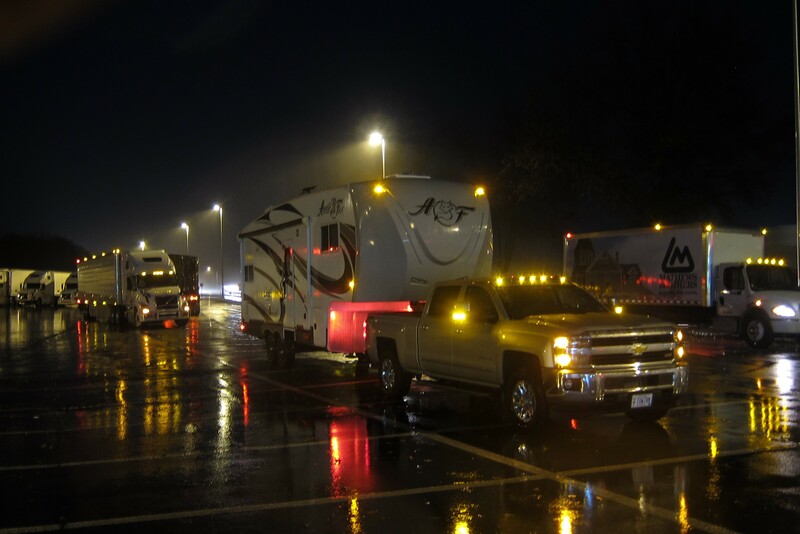 Kit and I agree that this truck stop was the quietest and most RV friendly of the many we have stayed at over the years! 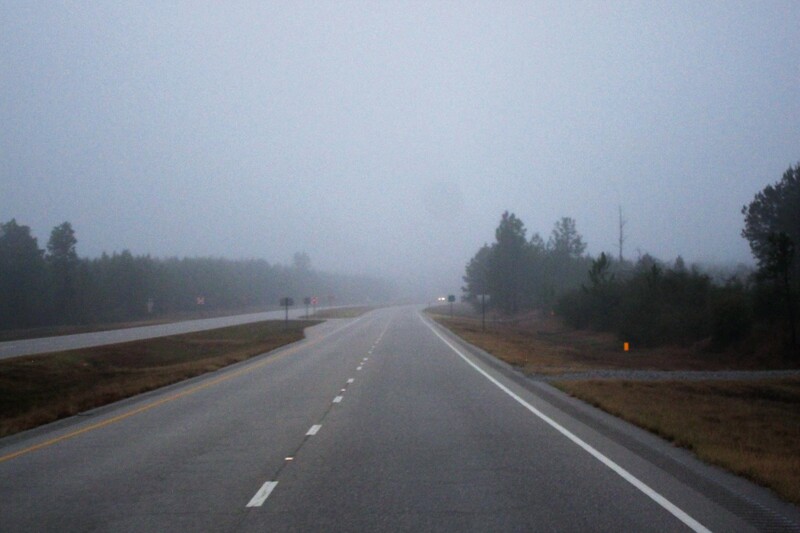 Back on I-59 we joined the traveling public heading south…the weather is drizzly but warm for early December. Within the hour, we crossed into the Central Time Zone gaining an hour in the travel day…so we decided to use that bonus time to enjoy a nice breakfast at, you guessed it, The Cracker Barrel! The further south we travel the thicker the southern accent becomes, and here in Gadsden, Alabama the accent is as thick as Tupelo Honey! And all the waitresses call us “Hon”. Following a substantial meal and enjoying the southern hospitality of the wait staff, who by the way laughed at our strange accents, we once again, were headed south. 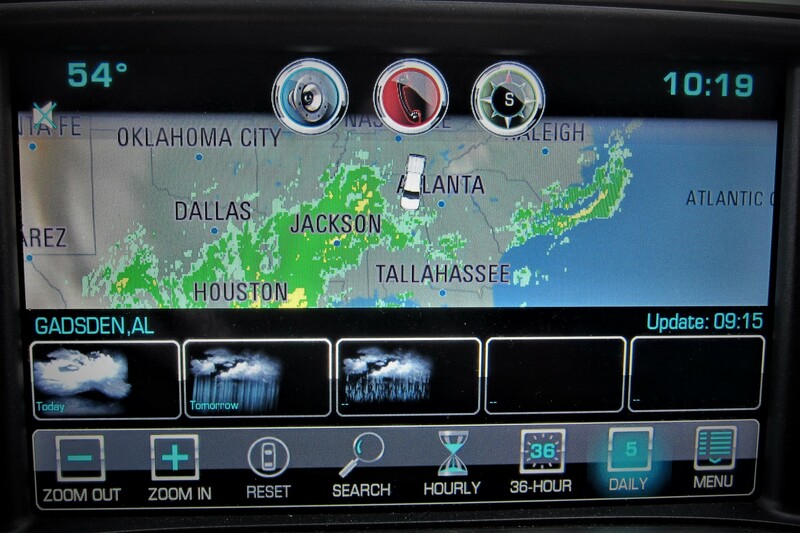 1000 hours found us circling Birmingham on I-459 as the threatening clouds finally let loose with torrential rain. Bringing up the trucks weather app we discovered that the rest of the day’s travel was destined to be wet and stormy. Soon, we moved over to I-65 South as the rain picked up in intensity and I slowed the rigs speed proportionally. 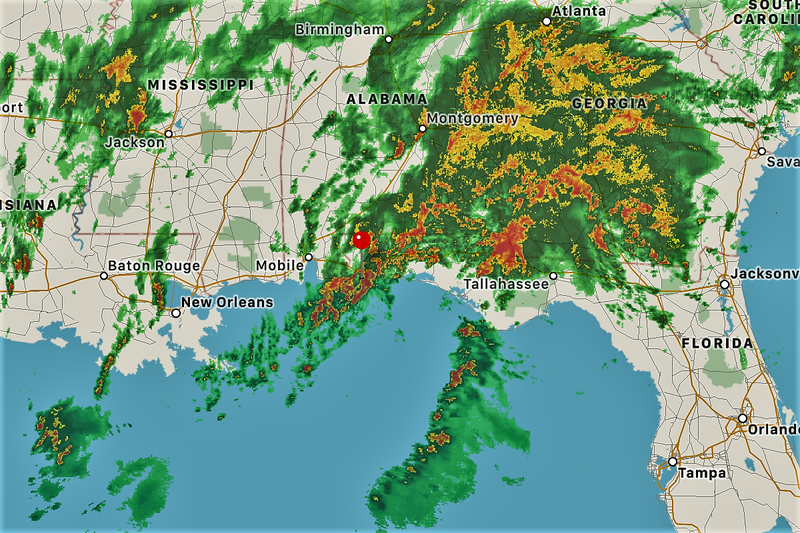 At 1330 we jumped onto US Highway 113 and within a few minutes received a Tornado Watch Warning via the weather app…Yikes. Thirteen minutes later found us crossing the northern border of Florida and under increasingly threatening skies we wound our way through a variety of back roads toward the Gulf of Mexico. Arriving at our destination for the next couple of days it was still raining hard accented by numerous lightning strikes and the wind had picked up in intensity…a real Southeaster! Backing the camper into our assigned site, I quickly plugged into electricity and left the rest of the camp setup for later. 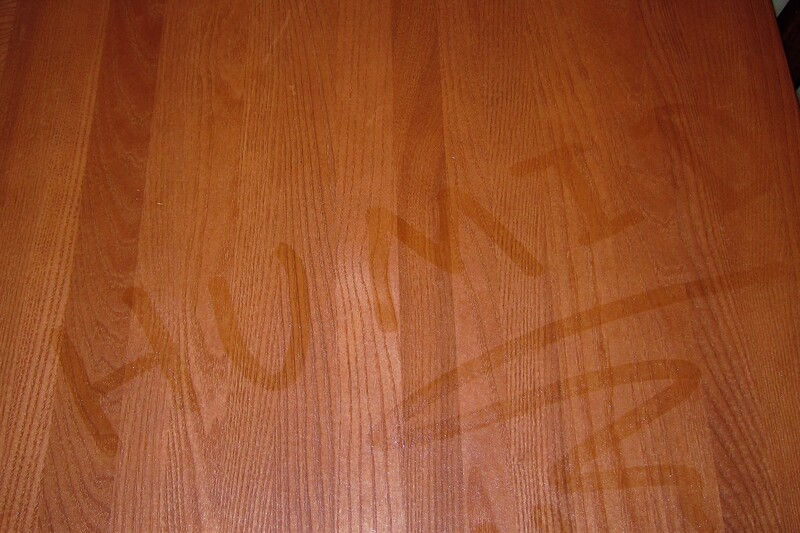 Since we had come from drier and cooler temperatures in the north to the warm and wet panhandle of Florida, every surface inside the camper immediate developed condensation. Kit and I had to open many of the cabinet doors to air out. We then settled in for what promises to be a noisy but hopefully uneventful evening…read as, NO TORNADOS!! Will our intrepid couple visit the Land of Oz? Stay tuned! Kit’s Bits: Hope you all enjoy my “sleep photo”. It will be the LAST one for this trip. Never mind, I couldn’t even find my neck pillow and had to improvise with my blankie. For some reason, (maybe his Navy days) Bill has ‘a place for everything and everything in its place’. It usually takes me a week or so to get things rearranged to my liking. I often wonder if he stashes things per the ABC’s. Other than forgetting his bike, the first few days went well this year. Looking forward to a few days of “down time” in the Panhandle of Florida before heading west at an easier speed. Leaving a test comment to verify functionality. 594 miles the first day! You really don’t like the cold do you? 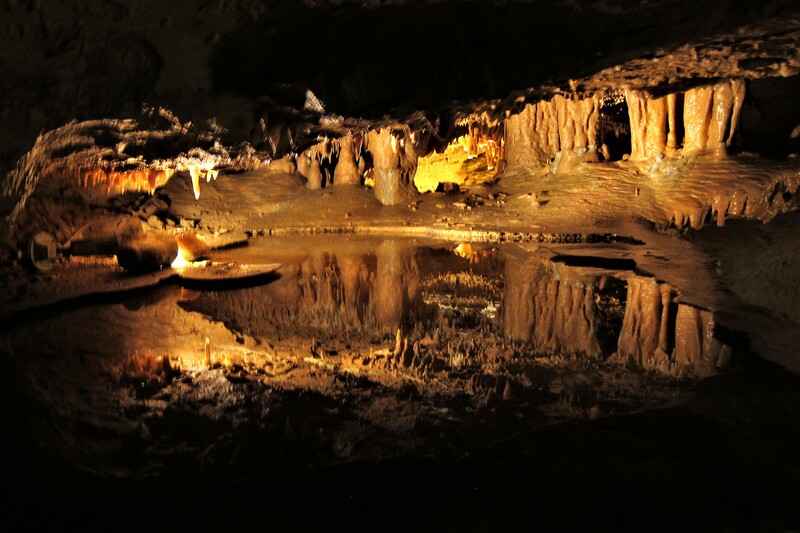 …..loved those Dixie Caverns! Salem, VA, isn’t that far away either! What a great idea to get married there…marriage-wise no way to go but up at that point! ….I love that you include the maps. Nice visual. Glad you managed to avoid any tornados too! I’m sure the Land of Oz is one place you wouldn’t want to visit….oh wait….I bet you would but not necessarily inside a tornado! What a great experience camping at a farm! Did your sense of smell enjoy it too? Kathy…keep an eye on that “paparazzi” who always seem to get you while you’re sleeping! The first comment of this years Excellent Adventure…and a wonderful one it is…thanks!! I thought I saw you sneak out of your driveway twice on 12/1/16. Now I know. Drat! So busted, can’t get away with anything in that neighborhood…which is as good thing! Hi, great to hear from you and thanks for the nice comment! Hope you folks have a great Christmas! YOU DEPARTED JUST IN TIME. THE BAY IS NOW FROZEN AND WE HAD A DUSTING OF SNOW TWICE. IT SOUNDS LIKE YOU DODGED ANY REAL PROBLEMS BEFORE REACHING A NEW TIME ZONE. KEEP IT BETWEEN THE LINES!!! Thanks for the comment, hope you folks remain healthy and have a great holiday! Love the story of the cavern on the campgrounds! These are fun discoveries. We had a similar discover of ancient carvings in New Mexico. If you hear of anyone wanting to purchase a 2004 Artic Fox pull behind send them our way. It served us well for many a winter! Thanks for the comment…I’ll post the info about your AF and be able to vouch for its quality and durability. I, too, wondered where the comment section went! Thanks for finding it! I wanted to comment that if that cross is the one I think it is, it is lit at night with lights that change from color to color. Is it at the Open Door Church right near the VA/WV state line on I-81? We have watched that church being built over the last several years. Hey folks, great to hear from you! I have been more forgetful lately but regarding the bike, I intentionally waited until the morning we were leaving to hang it on the bike rack, but at 0400 I was in a bit of a fog! Hope you two have a great Christmas! Glad we are back on the road again. I was growing moss under my feet. love my adventures with you both. be safe. Thanks for taking the time to blog about your adventures, always enjoyable! Stay safe! I notice there are no pictures of Kit in the cave; what stopped her from going the bats, the dripping mud, or both? Hi, great to hear from you and thanks for the nice comment. Kit isn’t into (no pun intended) caves…she’s a bit claustrophobic. Hope you and your family have a Merry Christmas. Bill ‘n Kit, enjoyed your first journal of 2016-2017 and look forward to the coming journals! Judging from tonight’s national weather forecast, good thing you’re NOT in Maine tonight! Wowzer! Hope your kids are safe and not driving about in THAT weather! Safe travels in the southland! Hi Nancy, thanks for the nice comment. Yep, we lived through many snowstorms over the years but no more! Hope you folks have a great Christmas!